An all time favorite snack to go for. Wrapped in mango powder and chickpea flour, this one's a delight for all seafood lovers. 2.Mix the flour, garlic, salt, pepper, chillies, coriander and mango powder, in enough water, to form a smooth paste. 3.Then add enough water to make a pouring consistency (when lifted in a spoon and dropped, it should fall in a continuous smooth stream). 4.Heat the oil in a kadahi till a drop of batter dropped in comes up at once. 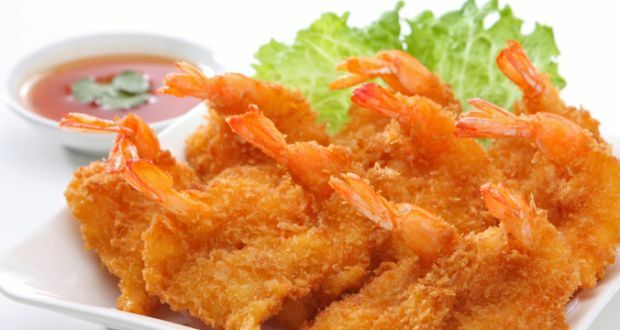 5.Dip the prawns in the batter and drop into the hot oil. 6.Fry over medium heat, to a very light brown. 7.Lift out with a slotted spoon and keep aside. 8.When ready to serve, heat the oil again and fry over high heat to a golden brown. 9.Remove from oil, drain on an absorbent paper, and serve with a chutney or ketchup.